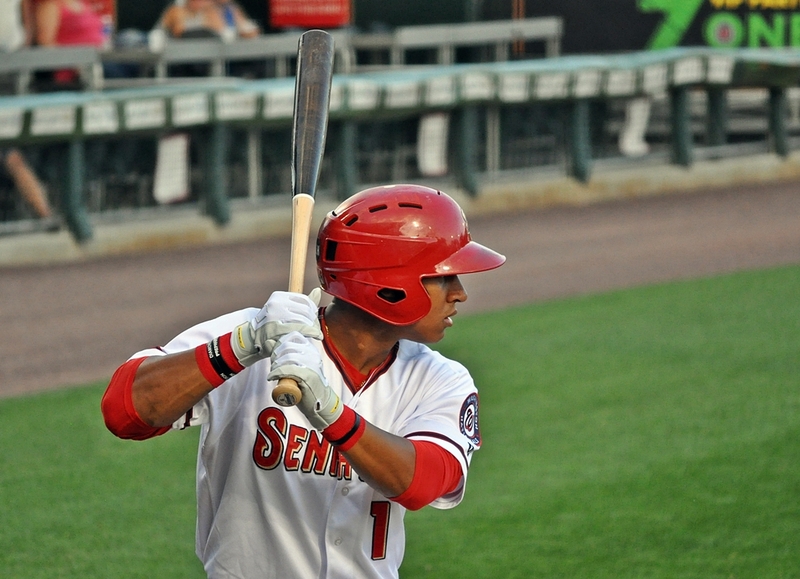 On Monday July 20th I traveled to Harrisburg, Pennsylvania and got a live look at Washington Nationals prospect Chris Bostick. The Harrisburg Senators fell to the New Hampshire Fisher Cats 3-2 in extra innings. Veteran starting pitcher Austin Bibens-Dirkx and the Fisher Cats bullpen held the Senators to just two runs on eight hits in the ten inning game. We originally caught up with Chris Bostick ( CTD: Chris Bostick ) in June of 2014 as he was just settling in with his new organization after being traded from the Athletics to the Rangers in the off-season. The second baseman from Rochester, NY continued to develop his game at the Advanced-A level. With the Myrtle Beach Pelicans, Bostick continued to show he had some pop in his bat, belting eleven home runs while playing in a pitcher friendly home ballpark. He also showed speed on the base paths, swiping 24 bases and hitting 31 doubles and 8 triples on the season. Deja-vu struck Bostick in the winter months following the 2014 season. Once again he was involved in an off-season trade which sent him to the Washington Nationals for Left-Handed pitcher Ross Detwiler. The Nationals would be the third organization for the young second baseman in three years. As the 2015 season began, Bostick was assigned to the Nationals Advanced-A affiliate the Potomac Nationals. He would begin the year back in the league he played in as a member of the Myrtle Beach Pelicans. After getting off to a slow start on the 2015 campaign, Bostick began swinging a hot bat on a road trip to his 2014 home in Myrtle Beach. In 62 games with Potomac, Bostick hit .274 with 4 home runs and a .344 on base percentage. In mid-June the Nationals promoted Bostick to the Double-A, Harrisburg Senators but not before a pit-stop in Hagerstown to get some practice in the outfield in case the Nationals wanted to use him at another position. As a member of the Senators, Bostick has seen most of his time at his familiar second base spot but he has seen action in the outfield in 13 contests playing mostly in left field. Bostick has been adjusting to the challenges at the Double-A level. In 51 games with the Senators, Bostick has hit .230 and continues to show power adding four additional home runs giving him eight total on the season. 8th Inning: Bostick reached base on a fielder’s choice. He hit a ground ball to shortstop Jorge Flores who got Issac Ballou out at third base. 10th Inning: Bostick struck out for the final out of the game. Bostick batted second and had a tough night at the plate going 0-5 on the night. At the plate, Bostick showed an aggressive approach and did not see many pitches in each of his at bats. The right-handed hitter put the ball in play in his first four opportunities with each going to the left side of the infield. Bostick was active at second base making a total of five plays on the night. While a number of them were on the routine side, Bostick made an outstanding defensive play in the fourth inning. New Hampshire’s K.C. Hobson lined a shot to the right side and Bostick showed great range and athletic ability making a diving catch to prevent the base hit. It was one of many above average plays by the Senators defense on that night. 1. Lets go back to this past off-season. For the second year in the row you were involved in an off-season trade. It had to feel like deja-vu. How surprised were you and how did you receive the news? After I was traded the first time I really wasn’t expecting to be traded again so it was a big surprise. I understand that it’s a part of the game and it happens I just didn’t think I would be one of those guys that gets traded multiple times. Luckily going through it the year before I knew what to expect going forward. I actually got the news when I was giving a lesson to a young kid back home and I got a call from my brother asking me if I heard any news. I didn’t and then he let me know that he just read something that I had been traded to the Nationals. 2. You started out the season back in the Carolina League with Potomac and got off to a bit of a slow start. An early season road trip had you back in Myrtle Beach and in that series you caught fire. Was it just a coincidence or did going back to a familiar place and ballpark help get you back on track? It’s always nice to go back to places you have been and see some friendly faces and people you have known from the year before. I think it was just a coincidence that I turned it around there. I had been working for a good part of that month on some adjustments to my swing and doing some different things. It just happened to start to click when we were there. 3. In June you got promoted up to the Double-A level. How did you get the news and how did it feel to be promoted up to the next level? It was awesome. I got the news after we had a day game in Potomac. It was just a few games before the All-Star break and I got called into the manager’s office. He asked me if I ever played the outfield and they actually sent me down to Hagerstown for a day. They just wanted me to go down, get some work in the outfield and shag some batting practice. I got to Harrisburg and for the first week or so they had me in the outfield. 4. Many players say that the hardest jump to make is the transition from Advanced-A to Double-A. Now that you have gotten your feet wet in Double-A has it been the biggest challenge you have faced? Yes, for sure, I would definitely say that this has been the most challenging jump of my career. The competition is a lot better, the players are a bit older and wiser. Everyone understands what they need to do to succeed at this level. Pitchers know how to get you out at this level and you’re not going to be in many situations that things are going to come easy. It’s definitely a challenge and its something I am adjusting to as I go. 5. The Nationals have been riddled with injuries this year. Many of the Nationals starters have spent some time rehabbing at various levels in the minor leagues. Ryan Zimmerman just spent some time in Harrisburg. When guys like that come in do guys like yourself get to interact and learn from them? It’s always helpful when someone who has that kind of experience comes down to get some reps in for a few games. Even if you don’t get a chance to get some one on one time with them just to be able to watch them and how they go about their business. I think that is whats really important those guys have reach and established themselves in the major leagues for a reason. You can see it in how they prepare and play the game. 6. In today’s game so much gets talked about in regards to advanced metrics and scouting. What do you do to prepare for the starter and the rest of your opponents on any given night. What resources are available to you? The one big thing we can use is video. We never seem to be short on video and always seem to have a few different feeds that we can watch to see the way he may pitch. We are able to see how he attacks hitters and how he sets them up with certain pitches. Before every game being able to watch the starter and look for any tendencies really helps prepare us for the game. When you are able to watch the video you don’t always feel like your facing the guy for the first time because you have an idea of what he can do from the video. We have other things such as spray charts that can help us as well but the video is the biggest positive that we can have and use. A big thanks to Chris Bostick for once again taking time out of his day to talk with us. Be sure to follow Chris on twitter at @leanonmeCB and keep following him all season long as he continues to adjust to the AA level and works his way up to the major leagues.